When I had Your kirpaa - kirapaa aaeiaa - when I was blessed with Your Grace, blessed with Your kirpaa, O WaheGuru jee O great Guru, when I was blessed with Your kirpaa - with Your Grace tho mai aaeiaa - then I came. Where did I come into? Saranee aaeiaa - I came into Your protection. When I came into Your protection bharosai aaeiaa - then complete 100% faith came into my mind. When I came into Your protection, when I saw that you saved the prostitute Ganika, when I saw that You saved sinners such as Ajaamal, when I saw that You changed Sajjan thag into Sajjan the saint, when You changed Bhumia chor into Bhumia the Gursikh then bharosai aaeiaa - I came to place all of my faith in You hey WaheGuru, sache Patshah jeeo. If we look at these lines again, tho mai aaeiaa - SathGuru Patshahjee I've come; man, bani, sareer - my mind, my words and my body - with all three of these parts of my mind, body and my words I've come into saranee aaeiaa - into Your protection. As I've come into Your protection bharosai aaeiaa - I've gained complete 100% faith in You. How has this faith come? Kirpaa aaeiaa - this faith has come with Your kirpaa - Your Grace. When You Graced me then I put my faith into You. Without Your Grace I cannot put my faith into You, Akaal Purakh sache patshah jeeo. Now that I've this faith I do ardaas in front of You, hey WaheGuru jee, hey SathGurujee jio bhaavai - as it pleases You WaheGuru jee thio raakhahu - look after me in that way, protect me in that way, nourish me in that way suaamee - O my lord. Jio bhaavai - as it pleases You save me. Save me in that way as it pleases You. Put me on that path which pleases You - maarag gurehi pathaaeiaa - I've been placed upon the path of God by the Guru, SathGuru Arjan Sahib jee is telling us today. Jio bhaavai thio raakhahu - as it pleases You, O lord keep me in that way. 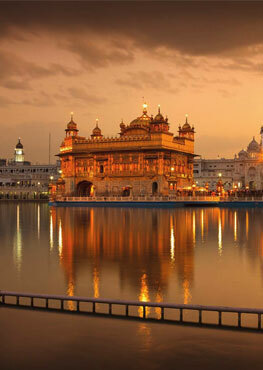 Maarag gurehi pathaaeiaa - this is the path of the Guru, this is the path that the Guru's Sikhs walk on. Rehaao - SathGuru Sahib jee says pause and think about this. Like the wind when it jhulaaeiaa - when it moves around the leaves make noise, in the same way when our mind is being disturbed by desires, by ego, by anger, by all of these things, the noises we make when we cry out in pain, Maharaj Sahib jee is talking about that. Pavan jhulaaeiaa - our soul is being carried along in this violent storm of the wind, like a leaf is carried along in the wind in the same way my soul, Maharaj Sahib jee is talking from the point of view of a jaggiaasoo - jaggia means to wake and aasaa means hope; that person in whom the hope of meeting hope has arisen is called a jaggiaasoo. Through this shabad SathGuru Sahib jee is explaining that avasthaa - that Maharaj Sahib jee my soul is carried away by the wind of maaeiaa..
By listening, when I sit down and listen to religious scripture sun sun with the ears of faith and belief. Sun sun has been mentioned twice; with the ears of faith and belief. When I listen to the religious scripture ddaraaeiaa - I have this fear in my mind. What is that fear, Maharaj Sahib jee says? Kararo dharamaraaeiaa - that Dharam raja - the judge of righteousness is kararo - always sticks to the Truth. As it says in Aasaa kee vaar: outhai sachae hee sach nibarrai chun vakh katae jajamaaliaa (Ang 463 Line 16 Raag Asa: Guru Angad Dev)- only the Truth is looked through at the path of dharma raja. When the righteous lord of dharma sits down and goes through all the good and bad that we have done, only the Truth will remain there and Maharaj Sahib jee says that listening to this I am ddaraaeiaa - Maharaj Sahib jee says in a good way that I have realized that I've something to fear that there is a world after. Maharaj Sahib jee is talking about entering into the protection of WaheGuru and how this helps us to walk upon the path. I've taken the outt - the protection, I've taken the support of the holy saints, of the sangat of the gurmukhs - those who follow the Guru, the great Sikhs of the Guru. Entering into the sangat, Sathgur Patshahjee says, I've meditated upon the Hari, upon WaheGuru who nourishes and protects all. That Hari who destroys the pains of all. Now mai pooraa paaeiaa - Maharaj jee says that entering into the protection of the Guru I've realized that I've paaeiaa - found the poora - the perfect Lord, the perfect Guru. Through the perfect Guru, through SathGuru what has happenend bharam ka naas - all of my bharam, all of my doubts, all of my attachments, all of greed, all of my anger, all of ego, all of my desires have been washed away because ab mai pooraa paaeiaa - because now I've found that WaheGuru, that Lord God through the Grace of the Guru. So Guru Sahib jee in this hukamnama sahib is talking about entering into the sharan - into the protection of the Guru and the bhavanaa - the feelings that we have in our heart as we walk upon that path.